The Wicking Dementia Research and Education Centre aims to reach a further million people globally with a $3,721,000 boost in funding from the J.O. and J.R. Wicking Trust. To be announced today (Tuesday 10 April) in Hobart, the third stage of funding from the Trust to the Wicking Centre will be used to maximise the reach of the Wicking Centre’s Massive Open Online Courses (MOOC) and improve dementia literacy worldwide. 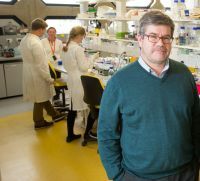 Wicking Centre Director Professor James Vickers (pictured) welcomed the funding, which he said was imperative to making the worldwide community better equipped to serve the needs of people living with dementia. “With approximately 46.8 million people with dementia globally and a rapidly ageing world population, dementia is set to escalate in prevalence, becoming a leading cause of death through this century and a major focus of health and social care,” Professor Vickers said. “Education will be crucial in caring for people with dementia so the Wicking Centre is taking on the challenge of reaching 400,000 Australians and a further one million people through its online education over the next five years. The Wicking Centre was established in 2008 through co-funding by the J.O. and J.R. Wicking Trust and the University of Tasmania, to improve the quality of lives of people with dementia and their carers. As part of this focus the Wicking Centre introduced the Understanding Dementia MOOC (in 2013) and the Preventing Dementia MOOC (in 2016), which have attracted around 146,000 participants globally worldwide. The Understanding Dementia MOOC (UD MOOC) is aimed at driving systematic change in the care of the elderly and the provision of support to carers, while the Preventing Dementia MOOC (PD MOOC) seeks to build community-wide knowledge and capacity to tackle modifiable risk factors for dementia, potentially leading to reduced prevalence of the condition. The latest funding will also be used to establish an evidence base of the impact of both MOOCS including an evaluation of dementia knowledge and literacy at baseline, completion and post 12 months, of the Understanding Dementia MOOC. Evaluations will also look at the effect of the Preventing Dementia MOOC on knowledge and on relevant dementia risk-associated behaviours. The Wicking Centre is part of the University’s College of Health and Medicine.